Owing to our expertise in the industry, we as a Supplier, Exporter and Importer strive to deliver nothing short of excellence to our customers. 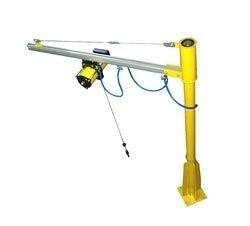 The Jib Cranes may swing through an arc, to give additional lateral movement, or be fixed. Our distribution network allows us to facilitate quick and convenient delivery in a matter of time at your doorstep. For our esteemed customers, we make it available at marginal rates.